The electricity grid was built in days when electricity could not be economically stored in large quantities and it had to be produced the instant it was needed and consumed just as quickly as it was produced. Modern energy storage technologies have changed all that, paving the way for the adoption of renewable energy sources, the offer of new customer services and a safer and more cost efficient grid. Energy storage is a vital tool for accomplishing the seemingly impossible task of matching the grid electricity supply to the demand on a second by second basis. But this is not its only task. Storage plays a critical role in frequency regulation and in maintaining the stability and safety of the grid. It enables energy to be harvested when available and stored for consumption at a more convenient time. It provides a buffer source for use in case of emergencies. Together these four functions ensure the essential grid system resilience. As a major bonus, energy storage enables more efficient deployment of generating resources resulting in major economic benefits for both the electricity generating companies and the network operators. Energy storage methods include not only electrochemical batteries, but also hydraulic (pumped) storage, mechanical storage (flywheels), thermal storage, compressed air storage, storage in an electric field (capacitors) and other methods. For the sake of convenience, "batteries" and "energy storage" are used interchangeably in this text though individual storage technologies may differ in the relative importance of some of their specific properties. Batteries have characteristics that make them ideal for grid energy management applications. Fast Acting - Batteries can deliver power almost instantaneously on demand. Bi-directional Energy Flow - Batteries can deliver stored energy or absorb surplus energy just as quickly. Scalable - A wide range of energy storage technologies is available so that batteries can be optimised for both power delivery and storage capacity and scaled from small portable containerised units to multi-megaWatt installations. Low Stand-by Costs - Batteries don't have the maintenance costs of keeping rotating equipment in readiness. The following diagram summarises the areas where energy storage has been successfully deployed to improve the technical and economic performance and the flexibility and resilience of the electricity grid. The electricity utility company's task is to provide an electricity supply which at all times matches the customer demand and in most countries their performance is regulated by law. Regulations include strict safety standards and very tight tolerance limits on the voltage, frequency and continuity of the supply as measured at the customers' premises. Complying with these requirements is one of many challenges for the generating and distribution companies because they must satisfy a fluctuating customer demand, over which they have no control, from resources which themselves may fluctuate in an uncontrolled and unrelated way. The electric power system must address two unique requirements: the need to maintain a near real-time balance between generation and load, and the need to adjust generation (or load) to manage power flows through individual transmission facilities. The electricity demand is the sum of the power requirements of thousands of different users ranging from individual households to large industrial and commercial enterprises all of whom may switch the loads, with widely different magnitudes, on or off at times convenient to whatever activities they happen to be involved in at the time. They expect the power to be available on demand and they don't consult the utility to warn them in advance and unlike telephone users, power users can not tolerate a busy signal. Depending on the duration of the mismatch, the immediate supply is maintained by the so called "spinning reserve" (see below) or batteries until an alternative, longer term generator comes into operation to take over the load. To meet this demand the electricity utility has at its disposal a range of "slow" and "fast" assets optimised to satisfy the fixed and variable components of the demand. Batteries, which are particularly fast acting assets provide the flexibility needed to meet this challenge. Dispatch refers to the method by which system operators (SO) decide how much output should be scheduled from the generating plants within their control which have been committed or which can be started quickly in the case of a power shortfall within their own network. The SO can also contract for a range of reserve services that can be called upon in timescales ranging from less than a minute to over an hour to help balance the energy supply and demand. Dispatch may also include the delivery of available surplus power to or from other networks, whether scheduled or in response to sudden demand changes. Dispatchable Assets are those assets which may be held in reserve or which are part loaded and can be called upon as required to deliver power within an agreed timescale. Dispatchable generating plants supply electricity that can be dispatched at the request of power grid operators. They can be turned on or off, or can adjust their power output on demand. Lead-in time or Response time of the generator: The maximum time between the request for, or assignment of the dispatched power, and the time when the power is fully on stream. Available power: The minimum continuous output power which the generator can deliver. Duration: The minimum period during which the specified power delivery can be sustained. Another way of expressing the energy required (or available). Timing: The time at which the availability of the power must be guaranteed. For example, during the daily peak load period or during a specific event. Location: The point at which the power is injected into the network. The greater the distance from the point of need, the greater the transmission losses. Cost: This usually depends on the scope of the other five requirements. in the worst case, if alternative or reserve supplies are not available the SO must resort to load shedding, (interrupting the supply), euphemistically called "demand management" in order to keep the demand and supply in balance. Energy is delivered to the consumers via the Transmission and Distribution (T&D) Networks which make up the electricity grid. The transmission network takes the electricity at high voltage (100 KV to over 700 KV - depending on the national standards) from both onshore and offshore generators and delivers it to demand centres or sub-stations for subsequent distribution. The various distribution networks step the voltage down to lower voltages (between 110 V and 100 KV - again depending on national standards as well as customer requirements) and deliver the energy to consumers' individual premises. They also pick up energy from small - scale distributed generators for subsequent distribution by the grid. On an even larger scale, "interconnection agreements" governing cross border transmission capacity between national grids allow connected markets to import and export electricity in times of need or to take advantage of price differentials between markets. Without energy storage, electricity would have to be produced the instant it is needed. In a large national network with a millions of consumers supplied by thousands of generators, keeping the supply and demand in perfect balance would be an impossible task. Consumers would experience a varying voltage, which could potentially damage their installations, or sudden blackouts when they had no power at all which could have serious consequences for applications needing continuous power. If there is a mismatch between supply and demand the generators speed up or slow down causing the system frequency (either 50 or 60 Hertz) to increase or decrease. If the frequency falls outside a predetermined range the system operator must act to add or remove either generation or load. More serious is the frequency instability which occurs when the demand and load are unbalanced which can produce dangerous instability in the network itself. These are only some of the symptoms of "power quality", or lack of it, and the affect on "grid resilience" caused by mismatched supply and demand which are discussed here. The aggregate demand tends to smooth out many of the smaller fluctuations so that it may follow large, but regular, daily or seasonal variations. However it still suffers unpredictable and rapid short term variations in both magnitude and timing superimposed on these longer period patterns. The graph below is a typical example. It shows the electricity demand for a multi-user office complex at the University of Berkley, California. Industrial and commercial users usually have regular working or opening times. Their overall demand builds up in the morning to a high level powering their operations during the day, then reducing in the evening to a much lower level during the night when their activities are closed so that their overall demand profile is reasonably predictable. Similarly the demand from domestic users tends to have a low peak around breakfast time, a fluctuating demand during the day and a higher peak during the evening when people return from work, followed by a low level during the night. Overall the daytime aggregate demand may be double the nighttime demand building up slowly in the morning and tapering off slowly during the evening. In addition there are longer term variations reflecting seasonal weather patterns or the timing of special events. Thus the daily and seasonal loads tend to follow large, but regular variations. The regular daily load demand pattern is a moving average of the total demand but superimposed on this average are many unpredictable, instantaneous demand changes due to the randomness of the timing and magnitude of the customer requirements as well as short term spikes and dips resulting from unexpected faults in the distribution network. Furthermore, a generating plant may be called upon suddenly to supply energy to compensate for faults or temporary capacity shortfalls in neighbouring parts of the distribution network reducing its capacity to supply its local network. In addition the grid is supported by a range of "reserve services", provided by contiguous networks and independent large scale industrial electricity generators such as steel works, cold stores, chemical plants and large water pumping stations, who can offer temporary spare generating or stored energy capacity or agree to demand reduction in order to deal with an unforeseen demand increase and/or the unavailability of generation capacity. These operating reserves may include both sources synchronised with the grid frequency as well as non-synchronised sources. Reserve capacity can be provided by many different sources, each with different response times before they are able to deliver their power. At the two extremes, short duration reserve capacity can be delivered within a second or less by energy storage systems, while longer duration reserves such as standby thermal generating plants could take hours to fire up and bring on stream. Assets whose capacity can be re-assigned in this way are called "dispatchable assets". If the available reserve capacity is insufficient to satisfy the demand, as a fallback position, the balance may be restored through a temporary reduction in demand (from industrial customers who agreed to be disconnected) which can be implemented quite quickly. The electricity "base load" is the minimum level of demand on an electrical supply system over a 24 hour period. It is supplied by the grid's most efficient plants operating continuously at their optimum capacity 24 hours per day. The balance of the demand varies throughout the day and is supplied by reserve capacity or by smaller more flexible plants as required. The load duration curve below is an alternative way of illustrating the load profile to indicate the type of generating capacity required to meet the demand and its expected utilisation. The base load is typically generated by very large, highly efficient thermal base-load generation plants, often called "slow assets" or "non-dispatchable assets" since they cannot easily respond to changes in demand. Because of thermal and mechanical inertia, if started from cold, these plants could take up to two hours or more to come on stream before they are synchronised with the grid and even longer to reach their full load operating point. The full output power of a generator can not normally be delivered immediately and a power plant's ramp rate is the rate at which it can increase its output. Ramp rates of coal fired power plants are only about 1.5% to 3.0% of full rated power per minute whereas the ramp rate of standby (dispatchable) gas turbines ranges between 10 and 100 MW/min. Designed to run continuously, base load plants thus have long lead-in times and tend to incur significant wear and tear if used to provide variable power output. The base load is supplied by the primary generating plant typically consisting of very large thermal power plants with generators driven by steam turbines with steam raised by burning fossil fuels (coal, oil and gas) or biomass or from geothermal systems and nuclear fission. Where the opportunity exists, electricity is also generated in hydro-electric schemes with hydraulic turbines driving the generators. There's not much scope for batteries here. The installed generating capacity is normally dimensioned to cope with the base load plus a margin of around 20% to cover unexpected emergencies, sudden demand peaks and plant breakdowns as well as shut downs necessary for carrying out planned maintenance. Flexible stand-by generators with a highly variable rate capability, also known as "fast assets" or "dispatchable assets" are employed to handle varying or sudden changes in demand to ensure that the varying power demand is met at all times. Many different technologies with lead-in times ranging from less than a second to several minutes are used to provide dispatchable power. Batteries are among the fastest responding assets with lead-in times of less than one second and equally fast ramp rates. They can be brought on stream within seconds and also shut down just as quickly, typically providing the necessary load following resources over timeframes ranging from minutes to a few hours to provide continuity of supply during the lead-in times of alternative, high capacity power systems which respond more slowly. The variable component of the demand is supplied by bringing into service, reserve capacity or smaller more flexible plants whose capacity can be varied to meet the fluctuating load. Prime movers such as gas turbine plants running on natural gas and diesel and gas engines are often used to drive smaller capacity generators to supply the varying loads as well as standby power. Such plants tend to operate below their rated capacity for much of the time, resulting in low efficiencies and higher costs. Furthermore, they can not be brought on line instantaneously which could be a serious drawback. For this reason, they are often used in conjunction with battery back up. The spinning reserve is the extra generating capacity which is available from base load generators to compensate for generation or transmission outages by turning on, or increasing the power output of, generators that are already connected to the power system. The total spinning reserve capacity is typically to 15% to 20% of the normal base load and falls into three categories. Immediate reserve or "Frequency responsive" spinning reserve necessary to cover initial transient loads and for maintaining system frequency can be available within 5 to 10 seconds from generators which are part-loaded and already delivering power, but running at less than full capacity, by increasing the torque applied to the turbine's rotor. Power requirements could be up to 50 MW for over 15 minutes. Large thermal plants can respond within the required timescale but only over a limited power range of up to about 3% to 5% of their capacity. Dispatch or operating reserve is spare capacity that is already on-line but unloaded or not running which can respond within 10 minutes. This also includes "hot standby" generators which are ready to run, but not fuelled. They may be expected to supply the full contracted power for over four hours. Scheduling or standby reserve which may take several hours to bring up to load are used to cover planned short term load increases. These standing reserves also include large numbers of small diesel generators, some as small as 250 kW, but with a total capacity of over 1 GW or more depending on the size of the network. They are used to provide short term operating power, often to ensure frequency stability, and are contracted to come on line within twenty minutes, and to stay on for up to four hours. Typically they may only start about twelve times in any one year resullting in a very low utilisation or load factor. These duties could just as easily be performed by batteries. Higher capacity standby reserve can also be provided by older, possibly less efficient base load thermal plants. Spinning reserves are the first to be used when shortfalls occur, but because they are provided by the base load generating plant, they involve high capital costs as well as high standby costs. Load following is characterised by power output which may change as often as every few minutes in response to the changing demand within a specific region or area, while at the same time maintaining the system frequency and voltage within their narrow limits. This means that for much of the time the generating plant is operating on "part load" which is less than its design or rated output. Consequently, the plant efficiency is reduced, and plant heat losses, fuel costs, and emissions are all increased. The efficiency of load following plants, even when operating at their optimum load, may not be as high as for base load plants but their construction and capital costs are usually much lower. Load following generating plants include steam turbines providing spinning reserve, hydroelectric power plants and high capacity gas turbine power plants running on natural gas which take from 2 to 5 minutes to reach full power. While Combined Heat and Power (CHP) plants may take up to 45 minutes for their steam generators to reach full output capacity, power can still be extracted from the gas turbine after the first few minutes during the waiting period before the steam is avaiable. Smaller installations typically use diesel and gas engine power plants with start-up times as low as 10 seconds. Emergency peaking power plants supply power only occasionally when there is an exceptionally high demand and are typically powered with gas turbines. While gas turbines are the most flexible rotating generators in terms of adjusting the power level, they are also among the most expensive to operate. Smaller networks may also use diesel generators for this purpose. Because they are only used to supply short time peaks, these assets are underused most of the time. Running only a few hours per year the load factor may be as low as 2%. As already noted, it used to be that electricity could not easily be stored on a large scale. As a result, supply and demand had to remain in balance in real time. The availability of newer battery technologies alleviates the problem of achieving this match. Energy storage systems provide fast acting energy buffers and are one of the major keys to system flexibility. They have the unique property that they can absorb energy as well as delivering it, so that they discharge to supply increasing loads and charge to absorb energy off-loaded from the generators when the demand suddenly decreases. Conventional rotary electricity generators can only provide energy, they cannot absorb it. Energy may be stored in bulk or distributed distributed across the network to support a variety of load matching applications. Pumped hydro storage and compressed air energy storage (CAES) connected at transmission level offer significant load balancing services, for example to respond to the variable output from some renewable energy sources or to capture the benefit of extreme variations in prices. The Dinorwig pumped storage plant in Wales with a peak power of 1800 MW can generate 1320 MW within 10 seconds and can deliver the full 1800 MW power for 5 hours which corresponds to a storage capacity of 9 GWh. The CAES plant at Huntorf in Germany takes 10 minutes to reach full power and can generate 290 MW for up to 4 hours. These storage facilities are charged using pumps or compressors using AC power from the grid and they deliver AC power back to the grid through AC generators powered by hydraulic and pneumatic / gas turbines. Opportunities for using these technologies are limited by the availability of locations with suitable geographic features. Apart from pumped hydro, CAES and flywheels, almost all other storage methods depend on DC storage so that in grid applications they need high power electronic circuits to build the rectifiers for charging and the inverters with AC output stabilised to the grid frequency for feeding energy back into the grid. Grid level energy storage can be provided by electrochemical batteries. Apart from flow batteries they are usually solid state with no mechanical ancillaries. They have short construction lead times and are flexible in size due to their modular construction. Their use is limited however by the ultimate size and cost of practical devices. They can provide the power but their capacity is limited. They also require high power AC-DC-AC conversion electronics. Flow batteries can provide bulk storage up to 10 MWh or more since their capacity is flexible and determined by the size of the two tanks storing the electrolytes. Lead Acid, Sodium Sulphur and Nickel Metal Chloride batteries have been used to deliver power of over 1 MW for periods up to a few hours. More recently a Lithium ion batteries with a capacity of 20 MWh delivering 40 MW power has been installed at Sendai substation in Japan with even larger installations scheduled to come on line in the USA over then next few years. Recent research has also demonstrated the feasibility of high temperature Liquid Metal batteries. Further developments of this technology are under way and claims of millisecond response times with potential multi-MegaWatt capacities have been made but so far no commercial batteries are available. Distributed Storage using electrochemical batteries and capacitors is installed on the distribution network closer to the load to provide fast acting response to sudden demand changes. In addition to the balancing services provided by bulk storage, distributed storage enables power quality management and improved system resilience and may also allow the need for upgrades to the distribution network to be postponed or avoided. 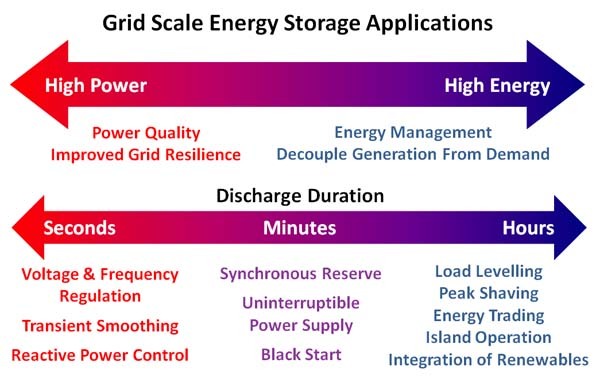 Storage system sizes typically range from 1 to 100 MW and the duration of discharge ranges between 15 minutes and 1 hour. Energy storage is well-suited to load following because of its capacity to act as an energy source or sink in response to both load and generating capacity changes. Most types of storage can also respond much more quickly than typical rottary generators when more or less output is needed for load following. Similarly they can usually operate at partial output levels with relatively modest performance penalties. On the downside, storage systems can not supply power indefinitely and the duration of supply is limited by the storage capacity. A wide variety of energy storage technologies have been developed for this purpose. See the table of Energy Storage Technologies below. Energy storage is an attractive alternative for supplying peak loads since the short term capacity requirements may be lower than for regular load following applications and well within the capability of batteries. Because they are able to provide power on demand, in smaller installations which do not have large spinning reserve capacity, batteries are often used to maintain uninterrupted power or temporary "ride through" to the load during sudden supply interruptions until slower responding alternative reserve capacity such as rotating machinery comes up to its operating point. Keeping the grid frequency and voltage within strict limits is essential for maintaining the stability of the grid. This requires access to very fast response assets. Fulfilling this need are electrochemical batteries and capacitors, both of which can start to store or deliver their energy within a few microseconds. Capacitors are paricularly fast but their storage capacity is limited by their low energy density. Capcitors of a reasonable size for grid applications will typically be discharged within a few minutes. See more about storage capacitors. Batteries have the speed but they also have the potential for higher storage capacity so that they can provide a sustained supply over several hours. Lithium ion batteries are particularly versatile in this respect. Black start is the provision of stored energy, or other local generating capacity, independent of the grid, to power a cold start of a base load generator with its associated ancillary systems until it is synchronised to the grid. Power requirements may be 10 MW or much more for up to 12 hours, mainly for running the generators' auxiliary equipment. The large scale incorporation of renewable energy sources, such as "run of river" hydraulic plants, solar arrays, wind farms, tidal flow and wave power into the supply mix introduces a level of unpredictability into the capacity available. For this reason they are classified as non-dispatchable because they cannot be relied upon to meet demand in when called upon to do so. Renewable energy resources are both random and intermittent and they affect the physical operation of the modern grid, resulting in increased difficulties in matching the supply to the demand. These issues are examined in detail in the section on Integration of Renewable Energy below. Government schemes to promote the use solar and wind power are giving rise to a host of small domestic and business micro-generating installations dispersed throughout the network. These promotions usually come with a commitment for the network operator to purchase any surplus energy from the generating plant. While the availability of extra energy supplies can bring opportunities for the network operator, it can also bring problems. First the distribution system has to be adapted for bi-directional energy flow and secondly, the amount and the availability of the energy are beyond the network operator's direct control making the problem of matching the supply to the demand even more difficult. One way of providing the necessary flexibility in the system to handle these energy movements is to provide for the possibility of distributed energy storage by installing batteries at the local distribution sub-stations. Energy storage allows the generation of electricity to be decoupled from the demand. Thus, within the limitations of the generating and storage assets, electrical energy can be generated at the most convenient time (during periods of low demand) by the most cost efficient sources and stored until it is needed (during periods of high demand) in a scheme known as "load shifting"
Load shifting including "peak shaving" and "load levelling" is the practice of changing the pattern of energy supply so that the generation of energy for consumption during the hours of peak demand is shifted to off-peak periods. This allows greater use of the more efficient base load generating assets and avoids the use and under-occupation of expensive peak load generators and enables cost savings and the possibility of energy arbitrage. This can only be achieved by using energy storage. Without energy storage, the short duration peak loads are normally supplied by fast acting peak load generators such as gas turbines. These are expensive assets, generally with lower thermal efficiency than the base load generators, and they may have a load factor of only 2% or less due to the limited time that they are required. Peak shaving refers to the clipping of the demand for immediate generating capacity during the short periods of peak demand and supplying the loads instead from stored energy sources. Peak generating or transmission capacity can thus be reduced by the total potential of all storage plus deferrable loads saving the expense of this capacity. The result is increased load factor, reduced generating costs, possible reduced power charges, and increased return on investment. Peak shaving can also be implemented by large industrial consumers to reduce their peak load consumption and the associated peak rate energy charges from the grid systems operators. Independent system operators (ISOs) may also offer incentives to consumers to reduce their peak demand on the network or encourage them to export excess electricity back onto the grid. Load Levelling is the rescheduling of the loads on the generating assets to cut the requirements during periods of high demand and to increase the production of energy during off-peak periods for immediate storage and subsequent use during high demand periods. Power system operators have used pumped storage hydropower (PSH) systems for many years to shift generation from peak to off-peak periods. The following diagram shows in principle how energy storage can remove the need for costly load following generators and replace them with an increase in the more efficient base load capacity operating continuously at its optimum level. During periods of low demand, the base load generator uses its excess capacity to charge the energy storage plant or battery and during periods of high demand the battery is discharged into the grid augmenting the base load generator's capacity to supply the peak demand. In this way the more efficient base load thermal power plants (i.e. coal, oil, gas, nuclear) can take on a greater share of the load. They can also be more efficiently and easily operated at constant production levels with a resulting improvement in the plant load factor. In practice there will usually be other reserve capacity in the supply mix. Load levelling reduces the cost of peak generation and enables more stable pricing with less variance between peak and off-peak rates. Load levelling is particularly useful for storing energy when installed in conjunction with generating capacity which has limited ability to modulate its output such as nuclear generating plants, or with renewable energy installations to avoid curtailment when they have surplus available energy for which there is no immediate demand. The utilisation of the existing network fixed assets can be optimised by using energy storage units and load shifting to peak lop both demand and generation to reduce thermal loading of overhead lines, cables and transformers during peak periods and to provide extra headroom to allow for network expansion or to accommodate renewables and low carbon technology applications into existing networks. Thermal monitoring of the most heavily loaded facilities will be required to maximise this opportunity without sacrificing safety. Energy storage enables electricity which is generated cheaply during periods of low demand to be used or sold at times of high demand when prices are high allowing the operator to capture the difference between prices at their peak and trough. This is also known as energy arbitrage. Energy storage may be used to defer the upgrade of sections of a distribution network whose peak load is becoming limited by the network's thermal performance. Using distributed energy storage to level the load at the power bottlenecks effectively reduces the local peak power handling requirement providing headroom for increased utilisation of the network. When the electrical power consumption momentarily exceeds the power currently being generated, whether due to increased customer usage or reduced generating capacity somewhere in the grid, the increased load on the generators will cause them to slow down and since the generators are synchronous machines, the frequency of the grid's alternating current will also decrease. Likewise, if the consumption suddenly falls below the power being generated or more generating capacity is switched onto the network, the generator will speed up and the grid frequency will increase. The obvious consequences for the consumer are that any devices such as clocks, which depend on the grid frequency as a timing reference for keeping the correct time, will also speed up or slow down. The consequences for industrial users may be more serious if their industrial processes are synchronised to the grid frequency. But the primary reason for the frequency control is not to keep clocks running on time. The main reason for accurate frequency control is to synchronise the rotation speed of the many generators connected to the network. Frequency mismatch between generators on the network can have serious consequences. When the two synchronous generators are connected in parallel supplying the same load there is only one current through the load so that the rotating speed, and frequency output of both generators, will be the same and locked to the frequency of the current through the load. The generator driving torques might be different, but they are synchronous machines and as such they will be locked into synchronism with each other. If for any reason the speed of one of the machines is changed, for example by changing the torque applied to the generator, then the frequency and speed of BOTH machines will be deviate from normal. If one machine's prime mover is not producing sufficient power to keep its generator's rotor spinning at the desired synchronous speed then the power will flow from the other prime mover to keep them both spinning at a new synchronous speed. This is known as "motoring" the generator. The slower "motorised" generator becomes a load on the system and will actually begin to drive its own prime mover which will consequently be subject to unintended forces. Furthermore, this can give rise to excessive currents in the network. This is not a normal condition and can result in damage to the generator or its prime mover as well as instability in the network. For this reason the grid frequency and generator rotation speeds must be controlled between very precise limits. The section on Frequency Regulation below explains how batteries help to solve this problem. The deviation from normal of the grid frequency is a measure of the imbalance between demand and supply in the network. Instability in the network may be caused when extra generating capacity is brought into service to compensate for a sudden imbalance when the demand exceeds the current level of supply. This is because there is the possibility of over-compensation when if the new capacity is brought on line causing the generator speed and hence its frequency to overshoot the normal. The system will respond by cutting capacity to bring the speed and frequency back to normal but at the same time giving the possibility of an overshoot in the opposite direction. In the worst case these overshoots can result in ever increasing oscillations or resonance in the energy flows which can cause serious electrical damage to the generator and possibly to electrical equipment connected to the grid as well as mechanical damage generator's prime mover. The slower the system response, the more likely this is to happen. As a last resort, if the frequency can not be maintained within its specified limits by increasing the generating capacity in response to an increased load, the network operator will shed some of the load by cutting off the supply to some of the customers to bring the remaining load into line with the capability of the available supply. A frequency deviation of more than around 0.5 Hz from the nominal value will cause rotating machines on the grid to disconnect as a safety precaution, increasing the likelihood of brownouts (intentional or unintentional reductions in the supply voltage) or blackouts (complete loss of the supply voltage). Frequency regulation is the means by which synchronism of the grid generators is maintained within acceptable limits and network stability is controlled. To avoid the possibility of damaging power imbalance scenarios adversely affecting the network, the network operator must maintain reserve generating capacity to cover imbalances with different magnitudes and durations to keep the generating capacity as close as possible in line with the demand at all times. Since the magnitude of the imbalance is reflected in the grid frequency deviation, the maximum permitted imbalance translates into a maximum allowable frequency deviation of ±1% of the nominal system frequency (50.00 Hz in Europe and 60.00 Hz in the USA). Managing this requirement requires fast acting reserve capacity which can be switched on to the network to provide immediate short term balancing and, possibly slower responding, generating capacity to cover longer duration capacity mismatches. Frequency regulation involves moment-to-moment reconciliation of the electricity demand and the supply. The reconciliation is done every few seconds and the duration of the intervention or support could be from milliseconds to minutes. Battery technologies are well suited to the task of managing grid stability acting as fast-reacting power sources or sinks on demand. When sudden variations in the load occur, they feed energy into the grid or absorb excess energy from the grid in order to stabilise the frequency. A step change in demand may require an increase in longer duration capacity, but fast acting short duration support will still be needed to provide the reserve capacity until other higher capacity generation is brought online. Typical power requirements are 10 MW or more with a response time of less than one second. Delivering an instantaneous and consistent power supply can be an elusive goal. Yet without it, grid frequency regulation is impossible and frequency regulation remains one of the primary economic drivers for grid-scale storage today. Power quality describes the electrical network's (grid's) ability to supply a clean and stable power flow acting as a perfect power supply that is always available, has a pure noise-free sinusoidal wave shape, and is always within voltage and frequency tolerances. The main contributors to voltage instability and interference on, or distortion of the voltage waveform, is the flow of reactive power, and the presence of transients and harmonics in the network resulting from the reactive loads and high power switching circuits connected to it. Energy storage is an essential component in enabling the modern grid to supply a reliable, clean, stable power flow within tight voltage and frequency tolerances. Such storage applications are usually served by capacitors and electrochemical batteries installed in local distribution sub-stations. Most of the loads connected to the grid distribution system such as motors, transformers and cables are inductive in nature and cause a reactive component of current to flow in the circuit supplying them as well as a resistive current flow feeding the device. The energy to supply this reactive current (whether for inductive or capacitive loads) has to be supplied by the generator which must divert some of its available energy to satisfy this demand. The consequence is that the voltage creating the resistive current falls, reducing the voltage across the network and thus the power available to the load. This means that the voltage at any point in the network will be less than the voltage available to a pure resistive load and will depend on the magnitude of the reactive power carried by the transmission line. The longer the transmission line the worse the problem becomes. As the generator attempts to drive more current through the line to maintain its power output, the load automatically increases the corresponding proportion of reactive current in the line thus reducing the line voltage even further. Unless action is taken to control the event, the reactive load could cause the system voltage to collapse resulting in a complete loss of supply or blackout. Because the generator supplies a multiplicity of loads and the network operator has no direct control over their number or nature, the voltage can vary widely depending on the reactance of the loads which happen to be connected. The voltage stability problem may be further compounded by the necessity to absorb the random power surges generated by wind turbines which could also cause the line voltage to swing wildly. Voltage Sags or Dips and Brownouts: Line voltage lower than the nominal voltage for short periods due to excessive loading on the system or network faults. Voltage Swells: Increased line voltage caused by switching off large loads or switching on capacitor banks or by power surges from wind turbines. Transients (Fast Disturbances): Rapid changes and spikes in the line voltage due to starting or stopping high power equipment drawing current from the line. Harmonics: Voltages at multiples of the supply frequency caused by high power switching systems and electronic loads such as variable speed drives and power controllers. Flicker: Random or repetitive variations in the voltage caused by intermittent high consumption industrial processes such as electric arc furnaces and welding equipment. These voltage instabilities are intolerable for users who expect a constant, clean supply voltage from their networks. There are of course controls put in place to prevent these problems from happening and energy storage plays a part in these measures. The problem and the solution are explained in more detail in the following section on Reactive Power Control. Much of the industrial and domestic power system load is made up by motors, transformers and cables which present an inductive load to the generators. When an inductor or electric motor is placed in an AC circuit it shifts the relationship between current and voltage. An inductor stores energy in a magnetic field. When a voltage is applied to an inductive device, it sets up a magnetic field in the inductive elements of the circuit which takes time to build up causing the current to lag the voltage. The presence of the magnetic field is an essential requirement for the functioning of an inductive load such as a motor so the generator must supply two components of power, the "reactive power", often called VArs (Volt Ampere reactive), to set up the magnetic fields and the "real power" to perform the work. Similar principles apply to capacitive circuits. A capacitor stores energy in the form of an electric field. When current is driven through the capacitor, it takes time for the voltage to build up across the electric field so that the voltage across the capacitor lags behind the current, or in other words, the current leads the voltage. In this case the reactive power is associated with the electric field. The diagram below illustrates the relationship between real power, reactive power and apparent power. Nearly all power system loads require a combination of real power (watts) and reactive power (VArs). Real power is supplied by a remote generator but reactive power can be supplied either by a remote generator or a local VAr supply. Before the advent of high power batteries, power factor compensation and voltage support in transmission and distribution (T&D) networks was the domain of switched capacitor banks, transformer tap changers and large, costly rotating machines. Now dynamic control of these network management functions is made possible by means fast acting energy storage systems. Confusingly called "Static Compensation", because they are stationary and don't involve any rotating machinery or mechanical switches, these systems actually provide continuously variable "dynamic" or "active" compensation depending on the status of the circuit. ALERT - (More Odd Naming Conventions) So called "reactive power" is said to exist in an AC circuit when the current and voltage are not in phase. The conventional use of the word "power" in the name is unfortunate and leads to confusion since reactive power does not perform any useful work. Further confusion arises because by convention it is asserted that in AC circuits, "Inductive components absorb reactive power or VArs" and "Capacitive components supply reactive power or VArs", but the reality is that reactive components actually exchange energy which flows in with one half cycle and out with the next half cycle and they neither absorb nor supply reactive power. Stated another (confusing) way, it is said that an inductor creates or supplies lagging VArs or gives reactive power, while a capacitor supplies leading VArs or absorbs lagging VArs since they are often used to cancel the lagging current in inductive circuits. For some reason capacitors in the power industry are often called "DC capacitors". When the Reactive Power or VArs flow from the “source” into a “load” it is said that Reactive Power or VArs are being "delivered" and the delivered VArs have a positive sign. When the Reactive Power or VArs flow from the "load" into the "source" it is said that Reactive Power or VArs are being "received" and the received VArs have a negative sign. The "apparent power" is the product of the current and voltage of the circuit and is the vector sum of the real power which is the capacity of the circuit to perform work and the "reactive power" which is the non-productive power charging the reactive elements of the load during the positive half of each cycle and discharging them during the negative half cycle. Thus on average, exactly as much reactive energy flows into the load as flows back out again and there is no net energy flow over one cycle. Reactive energy thus ebbs and flows and there is no net transfer of energy to the load. Even though the generator does not provide net real power to the reactive elements of the loads it must however provide the energy to cover the I2R losses associated with the current associated with the reactive power flowing through the network to the loads as well as through the resistive elements of these reactive components. These resistive elements also cause a volt drop across the network. More importantly, the generator has a fixed capacity, usually limited by the power of the prime mover, and increasing its reactive load reduces its capability to deliver real power and perform useful work by causing its output voltage to drop consequently reducing the overall system voltage. Thus the reactive power regulates the voltage in the system. Increasing the reactive load on the generator lowers its voltage and as the voltage drops, the loads demand more current to maintain their magnetic fields and to compensate for the loss of power causing a further increase in the reactive load and a consequent reduction in the power factor exacerbating the problem. In extreme cases a voltage collapse can occur when the generator is called upon to serve more load than the voltage can support. The system safety procedures may respond by shutting down the generator, possibly overloading other generators in the network causing cascading failures. The power factor in AC circuits is the ratio between the "real power" flowing in the load and the "apparent power" being supplied. The current through resistive loads is in phase with the applied voltage but the current through inductive loads, such as motors and transformers, lags the applied voltage while the current through capacitive loads leads the voltage. The power factor is equal to 1.0 for purely resistive networks and negative and less than 1.0 for inductive circuits (lagging currents) and positive and less than 1.0 for capacitive circuits (leading currents). In both cases the apparent power supplied by the generator must be greater than the real power, though only the real power does any work and the difference due to the reactive power is dissipated in the distribution system and resistive elements of the load. Thus a generator with a fixed power output feeding a load with a power factor of less than 1.0 will deliver a reduced voltage at the load. The generator must therefore produce more power to maintain the real power delivered to the load. A load with a low power factor thus demands more reactive power or VArs and draws more current than a load with a high power factor for the same amount of useful power transferred. It also wastes more energy and requires larger cables and other equipment to deliver the power all of which add significantly to the costs. Power factor correction seeks to counteract the lossy reactive power flows by introducing compensating reactive components to balance the positive and negative reactances to bring the power factor back to unity and thus reduce the generator current. Most loads on the grid are inductive and passive power factor compensation can be provided at the substation by connecting capacitors in parallel with the load. However the loads on the grid are usually variable since they are the aggregate of the loads from numerous consumers, while the capacity of the capacitor banks is only available in fixed increments so that the compensation is only effective over a narrow reactance range. Industrial consumers may provide this compensation on their own premises. Similarly voltage regulators and power transformers with on-load tap changers (OLTC) can be installed in sub-stations to provide voltage control. Looking at power factor compensation and voltage control in a different way, we recognise that reactive loads need real power to do the work and reactive power (VArs) to set up the necessary magnetic or electric fields in the loads to enable this work to take place. Instead of the generator providing the total apparent power, we can arrange that the generator provides only the real power, operating in its most efficient mode with minimum losses through the supply network, while the reactive power can be inserted by a different source at a point closer to the load. This is the basis of local power factor compensation and voltage support which form part of the overall network transient stability control. FACTS is a family of devices and systems designed to provide the essential reactive and real power compensation necessary for transient stability in the grid transmission and distribution networks in response to large disturbances or faults. Key to meeting their performance requirements are very fast reaction times in order of tens of milliseconds. Energy storage is a fundamental component of many of these systems. STATCOM coupled with energy storage can provide instantaneous and continuously variable reactive power in response to grid voltage transients, enhancing the grid voltage stability. It is just one example of FACTS and its operation and use are explained here to illustrate the role of energy storage in providing transient stability control in the network. Dynamic power factor compensation and voltage support are commonly implemented through reactive power management by means of a so called "Static Synchronous Compensator" known as STATCOM which behaves like a variable inductor or capacitor. In its simplest form it is composed of a thyristor controlled synchronous voltage inverter which produces an AC line voltage with variable magnitude and phase. See following diagram. The DC reference voltage supplying the voltage inverter is provided by a large capacitor which is kept charged from the transmission line via a coupling transformer and a rectifier. A feedback control system keeps the capacitor voltage almost constant in spite of the fast charge flow required by the reactive power control. By changing the firing angle of the thyristors controlling the inverter, the phase of the reactive power output is continuously controllable from plus 90° to minus 90°, with respect to the voltage, covering the entire range from maximum lagging to maximum leading reactive power. The inverter AC output is interfaced in shunt to the transmission line through the coupling transformer which enables it to inject current into the line. When the transmission line voltage (Vt) is greater than the output voltage of the inverter (Vc), the STATCOM generates Inductive (lagging) reactive power or VArs which are injected onto the line causing the voltage to drop. When the line voltage (Vt) is lower than the converter output voltage, it generates capacitive (leading) reactive power, neutralising or absorbing the lagging reactive power or VArs from the main transmission line and thus increasing the line voltage. STATCOM can thus inject a precise amount of reactive power into the system to maintain the voltage at its nominal value and the power factor at unity at the point of connection in the T&D network at which it is installed. Such a system needs extremely fast reacting energy storage (sub- second) capacity to supply the power for which large supercapacitors are normally employed. Using a capacitor as the voltage source enables reaction times of less than 10 milliseconds in response to voltage disturbances, however capacitors have limited storage capacity which in turn limits their capability to provide active (real) power. By connecting a suitable high energy density storage device such as a lithium ion battery in parallel with the reference capacitor, the system can be designed to supply or absorb active (real) power. This improves fault ride-through capability but also makes it ideal for integrating wind turbines, by converting the irregular fluctuating voltages which they generate, into a constant voltage thus levelling and maintaining a stable power transfer. This is known as "capacity firming". STATCOM can be used to provide dynamic power factor compensation either at the generator or at the load. Providing compensation at the generator would not necessarily be appropriate for all the different loads on the network which it supplies. When it is deployed near the load, the main generator is relieved of its responsibility for providing the reactive power (VArs) and it sees the network as a pure resistive load and the I2R losses associated with the reactive power flowing through the transmission and distribution networks to the load are eliminated. Furthermore when the compensation is installed in the lower voltage distribution network it can be optimised to match the characteristics of the local load and implemented with smaller storage and power control equipment. Voltage support is the power injected into the electrical distribution grid to maintain voltages within the acceptable range at every stage between each end of all power lines. Unlike system frequency, which is consistent across the network, voltages experienced at points across the system depend on the real and reactive power characteristics of the load and a low power factor results in low voltages at the load points. Using STATCOMs to inject reactive power (VArs) near to the loads enables the system voltage to be maintained by avoiding transmission losses and the consequent voltage drops across the network due to the flow of reactive power. This is particularly important for minimising the effects of rapidly varying, high consumption loads. This is the requirement, when a system fault occurs, to maintain the supply voltage during the short period between the occurrence of the fault and the time when the reserve capacity takes over supplying the load. Solutions usually depend on generating reactive and real power close to the load so that the fault does not result in a voltage drop. STATCOM thus enables the generators to damp voltage disturbances in the electricity network and helps them to ride through system fault events. Flicker is the subjective impression of light density fluctuations, caused by rapid and repetitive fluctuations in the supply voltage. It is caused by activating and deactivating large loads such as reciprocating or intermittent electric drives, electric arc furnaces and pulsed power equipment as well as fluctuations in the supply side from variable generators such as wind turbines and inverters. Apart from the subjective effect, supply voltage fluctuations can seriously affect sensitive electronic equipment and industrial processes which depend on a stable supply. Flicker compensation is fundamentally different from standard reactive power compensation. The aim is not a particular target power factor but to keep the voltage constant during rapid changes in load. The drop in voltage during a change in load can be split into two components; a "drop in actual voltage" and a "drop in reactive voltage". Caution: In some designs the FACTS reactive elements can themselves create voltage fluctuations and harmonic noise when switched on or off thus supplying or sinking reactive power regardless of the load conditions. Systems need to be designed to avoid the possibility of resonance's caused by the interaction of the control elements with the load resulting in system instability. Harmonics are voltages on the power line at multiples of the supply frequency caused by high power switching systems and electronic loads such as variable speed drives and power controllers. Resonance between the line inductance and customer installed power factor correction (PFC) capacitors can make this worse. See more in the "Integration of Renewable Energy" section - next. Wind and solar energy have zero or very low marginal costs, which means that as long as a system operates within transmission and operating constraints, wind and solar power tend to displace conventional generation. Tidal and wave power also have low marginal costs but there are fewer installations. Most renewable energy installations such a wind farms and solar arrays however are not viable without the use of storage and these storage requirements are being increasingly met by lithium ion batteries. Apart from the variability of the supply however, the problem with these intermittent energy sources is that energy may be available when it is not needed and may not be available when it is needed. Although there is no Sun during the night, at least we know that the Sun comes up every day and the variation of its received radiation intensity tends to roughly match the electricity demand profile. The wind however is less predictable. See Wind Supply Characteristics. It may blow twenty four hours per day, but its intensity is highly variable. Wind turbines generate no electrical power at very low wind speeds and must be stopped to avoid damage when the wind speed is very high so that they could be idle for three days or more waiting for suitable wind conditions. Tidal power also follows a daily pattern depending on the position of the Moon rather than the Sun but its magnitude is also subject to large variations as is wave power, which like the wind, is usually available twenty four hours per day. Unfortunately the power output from these sources cannot be accurately predicted or controlled by grid operators. Electricity storage is however eminently suitable for damping and smoothing out the variability of these systems and is being widely used for this purpose. Technically, the dynamic operating requirements for a storage system in these generating applications are the similar to those needed for a storage system to respond to a rapidly or randomly fluctuating load profile, but in addition the storage capacity required to cover interruptions in the supply is much higher, unless the installation is backed up by a conventional generator. Capacity firming is the conversion of available uncontrolled random power from renewable sources, from "Take it when you can get it" into "dispatchable power" with an agreed level and duration which can be committed as part of the utility's generating assets. Because of the random nature of the direction and speed of the wind, wind turbines provide a fluctuating supply to the network. Similarly the output of solar generators fluctuates due to the varying density and movement of the clouds. The output can however be maintained at a committed level for periods between 30 minutes and one hour by use of short term energy storage provided by STATCOM. Compensating for fluctuating supply voltages is similar in principle to compensating for fluctuating loads. Both provide voltage support by injecting reactive power into the network. The magnitudes and durations of the fluctuation in the power derived from the wind and the Sun can be much greater than typical load fluctuations so that the compensation must incorporate "real power" as well as "reactive power". This can be provided by STATCOM using a battery in parallel with the voltage reference capacitor to accommodate the much greater energy flows. Such systems may be able to accumulate or deliver active power in the range of tens of MegaWatts for tens of minutes. The production of renewable energy can be decoupled entirely from the delivery by capturing and storing all the generated solar and wind power in batteries for sale as a single block during peak demand periods when prices are high. The Kahuka Wind project in Hawaii uses batteries with a potential power output of 30 MW and a storage capacity of 10 MWh to maintain a steady flow of electricity from a wind farm. Renewable energy has a very low marginal cost. When the amount of renewable energy currently being generated exceeds the current energy demand, systems operators must either curtail the supply thus wasting this available low cost resource or find a home for the surplus. Energy storage enables this surplus to be harvested when it is available for use when the demand increases. The modern grid provides opportunities for consumers, both domestic and industrial, to feed power derived from renewable sources back into the grid. This is designed to encourage investment in so called "green" or "low carbon" energy and gives the utility access to extra resources. It does however come with a cost. The utility must provide for two way energy flow with metering and billing facilities. Energy is inserted back into the grid by local micro-generators when it is available, not necessarily when systems operators need it. Safety systems must therefore be installed to protect maintenance engineers working on the network from nasty surprises when consumers suddenly dump their surplus energy onto the line. These random flows can only be accommodated by installing buffer energy storage at the local sub-stations so that they can be consolidated and saved for subsequent dispatch in a controlled manner. Consumers will also need storage to make optimum use of their solar and wind generating capacity for their own consumption, or to store energy until the optimum price window for sale back to the utility. Typical domestic storage capacity is between 10 and 25 KWh delivering a power of about 10 KW. Opportunities exist in railway networks to recover the energy from regenerative braking of electric trains operating on the network. Electric vehicles (EVs) use AC or DC motors to accelerate the vehicle up to speed and to overcome friction and wind resistance to maintain that speed. When the brakes are applied to slow an EV, the electrical energy supplying the motor is cut off. The motor is now driven by the wheels and acts as a generator during deceleration and coasting. The back EMF generated by the motor serves to aid the deceleration while the vehicle's kinetic energy is converted (regenerated) into electrical energy. This recovered energy may be stored in a battery or wasted or in the case of electric trains it may also be returned to the grid. DC rolling stock may store the recovered energy temporarily in either track-side, or on-board, batteries for use in accelerating the train once more. AC rolling stock can feed the energy directly back into the grid. A typical modern electric train can save around 15 to 20 percent of its energy by using regenerative braking, reducing the grid's peak load requirement. The UK's biggest commuter rail network, South West Trains, with More than 200 trains is expected to save 15 million kWh of electricity annually by adopting regenerative braking in their trains or 75 MWh per train per year. Depending on the application, renewable energy installations may use a variety of storage technologies ranging from ultra-rapid response systems based on super-capacitor technology, with a peak capacity of 4 MW for up to 6 seconds to higher capacity, slower response systems based on a wide variety of available storage technologies delivering power of up to 1 MW or more for periods of over 24 hours. The smart grid is a communications and control network, overlaid across the power grid, monitoring customer demand, the grid's generating capacity and the status of its generating, transmission and distribution resources and managing power flows to optimise grid performance. Distributed energy storage provides the flexibility necessary for implementing many of these performance improvements and new customer services. involves sophisticated energy management systems, incentives, and a viable trading market. System Resilience is defined by its Robustness: How hard is it to knock down? and its Recovery: How quick can it get back up? Resilience of the grid infrastructure is its ability to avoid or minimise the magnitude and/or duration of service disruptions due to extraordinary events. Its effectiveness depends upon its ability to anticipate, absorb, adapt to and/or rapidly recover from a potentially disruptive or hazardous events. Extraordinary events may include external factors, such as the weather, accidents, overloads or terrorism, and internal factors, such as equipment failure, maintenance faults, system control and management limitations and readiness. In the worst cases, if faults are not addressed quickly enough they could lead to cascading failures across the network and ultimate closure of large sections of the grid. Energy storage is a key resource for maintaining grid stability, flexibility and continuity of supply. Batteries are vital components in the frequency stability and voltage support systems outlined above on which the network stability depends. Energy storage is also an essential component of reserve capacity maintaining continuity of supply during fault conditions or equipment outages. Batteries are indispensable components needed for achieving grid high resilience but like all components they also have their vulnerabilities. By incorporating cyclic redundancy into the batteries, the cycle life of modern electrochemical batteries can be extended by up to 25%, an important benefit for these high value assets. Equally importantly, cyclic redundancy provides the battery with immunity from single cell failures. The battery will continue functioning at full power even after one cell fails or at reduced power after multiple cell failures, an important contributor to system resilience. See the Software Configurable Battery for details of how it works. Special measures may be required to guarantee supplies to remote customers. Some island communities or industrial sites without local generating capacity may be connected to the grid through a single vulnerable link. In such cases, emergency power may be provided by large batteries able to maintain supply for a day or more. Containerised batteries can provide temporary power in case of emergencies or to support special events. As the grid becomes more complex with the incorporation of distributed energy generation and storage, with local control of some energy flows being delegated to the customer, the system management becomes ever more complex. The traditional grid management is evolving into the Smart Grid with responsibilities for maintaining system resilience and safety and the efficient use resources. 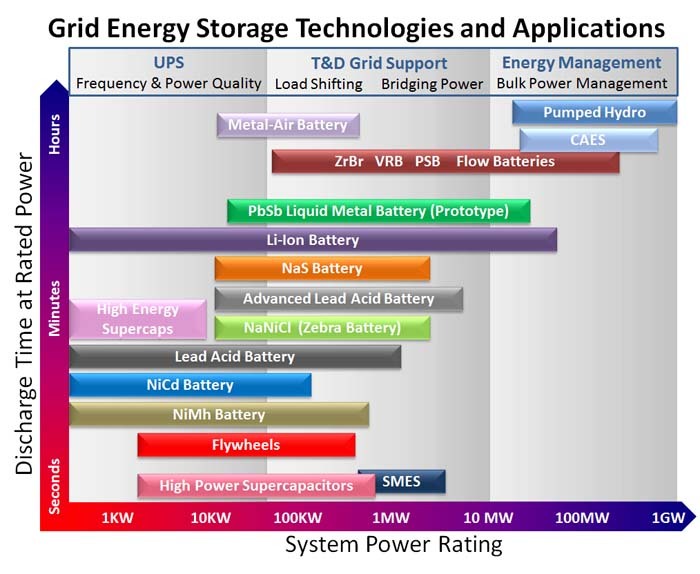 The following diagram illustrates applications and deployment of energy storage in the grid and indicates typical requirements. The voltages indicated in the above diagram are typical of the UK electricity grid and may be different in other national networks. Replace crude network reactive power control by means of capacitor banks and tap changers with variable power quality management. Improving power factor and protecting customers from power sags, swells, flicker, harmonics, transients, spikes and failures. Use energy storage units to peak lop both demand and generation to reduce thermal loading of overhead lines, cables and transformers and provide extra headroom to accommodate renewables and low carbon technology applications into existing networks. Eliminate curtailment of renewables during periods of over-supply. Capacity firming. Transform "take it when you can get it" power into scheduled, dispatchable power. Regenerative braking in electric trains. Braking energy returned to grid. There are numerous energy storage technologies, each with different characteristics and the electricity grid makes use of all of them. Cost competitive energy storage technology - Achievement of this goal requires attention to factors such as life-cycle cost and performance (round-trip efficiency, energy density, cycle life, capacity fade, etc.). The reliability and safety of energy storage technology as deployed must also be validated. The following table shows the grid activities which need energy storage support together with suitable battery technologies for providing this support. Follow the links for more details about the individual battery types. All of the above storage systems need ancillary power electronics for some or all of the functions such as battery management, rectifiers, inverters, converters, power control, safety systems, and cooling. The electric utility needs fast acting assets for system stabilisation, intermediate response assets for load following while slower assets can be used for buffer storage. Batteries can provide ideal solutions to all of these requirements. Furthermore they have the added advantage, that not only can they deliver power within one second when required, but they can also absorb power when the supply exceeds the demand. The combination of these properties make the battery ideal for a wide range of grid applications. In general, with a few exceptions, the response times of energy storage are very short. The chart shows the power handling capacity of each these systems and the duration for which this power can be sustained. There are two aspects to the financial justification for energy storage applications in the electricity grid, the operating benefits and the trading benefits. The seven challenges outlined above and the accompanying table indicate numerous opportunities where the use of energy storage can reduce costs, improve efficiencies, facilitate the use of renewable energy, increase grid resilience and provide new customer services all of which can be realised with existing technologies. A range of specialist batteries is available for this purpose and the implementation of these applications is within the control of the utility's management. The next step is for each application to be backed up by a detailed cost study. Trading electricity is not like buying and selling other products. Under normal circumstances it is not possible to keep a stock for sale and when customers need it they want it immediately and are not able to wait in a queue. It has to be available on demand in the precise quantity needed while all the time supply and demand are continuously varying. It is energy storage that makes trading possible. Trading is the job of the dispatcher. Economic dispatch is the short-term determination of the optimal output of a number of electricity generation facilities, to meet the system load, at the lowest possible cost, subject to transmission and operational constraints. It is also the basis of the electrical energy market. “Dispatchable” power, which can be ramped up and down quickly, fetches the highest market price. Distributed power, generated close to the electricity meter, can also be worth more, as it avoids the costs and losses associated with transmission and distribution. Research by the Pacific Northwest National Laboratory found that fast acting energy storage was 40% less costly than the slower primary spinning reserves because their better ramp up speed and lower standby costs. The realisation of the potential trading benefits however depends on the regulatory environment in which the utilities operate. International standards facilitate international trade, but every country, or group of countries, also has its national laws and standards which may include not just regulating the power quality, reliability and safety, as well as mechanical and electrical connection interface standards, but also ownership of the business and pricing of its products and services. In some countries, utilities are regulated and may be government controlled or owned, with prices or prices set by a government regulator. Whether an application is cost effective or not depends on whether the investment cost can be recovered within the regulator's price guidelines. Whether or not utilities can pool resources may also depend on the government's view of monopoly ownership. In other countries utilities are deregulated and free to operate as they wish. Generators, distributors and retailers may be completely independent which makes the market more competitive. Trading opportunities must be judged against this background.